Is your community, school, or workplace experiencing tensions over religious diversity? Are conflicts over religious expression eroding team spirit and blocking the flow of information? 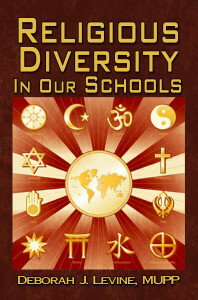 Award-winning author, Deborah Levine, has released the original study of Religious Diversity in our Schools, updated for current challenges of diverse religions living together. Discover the “Harmonize NOT Homogenize” strategy. Use the Quick Reference Religious Diversity Cards to navigate cultural differences for more than a dozen faith traditions.